The text for the 23 October 2013 meeting was Brady Thomas Heiner’s ‘Foucault and the Black Panthers’ (City, 2008). The article traces the evolution of Foucault’s later writing on biopower and the disciplinary society on his encounters with the Black Panther struggles. 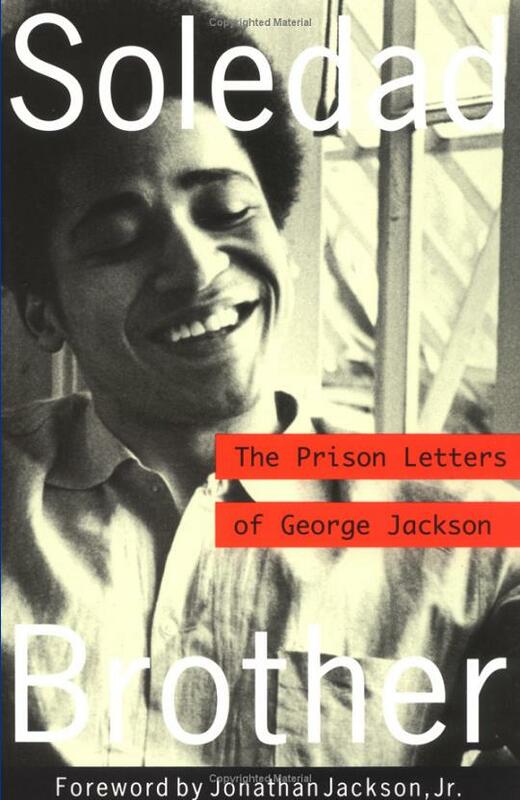 Exposing connections such as Foucault’s friendship with Jean Genet who apparently gave Foucault the prison writings of prominent Black Panther activists George Jackson and Angela Davis (Genet himself wrote the preface to Jackson’s Soledad Brother), Heiner asks why Foucault committed ‘epistemic violence’ by not acknowledging the Black Panthers as an inspiration for his conceptual framework. Epistemic violence or injustice was defined by Heiner (quoting and following Miranda Fricker) as: when ‘a speaker receives the wrong degree of credibility from his hearer owing to a certain sort of unintended prejudice on the hearer’s part’. Initially, the article was contextualised within a current influx of revisionist histories that seek to uncover silenced projects and influences e.g. of Black and Left movements. Examples included Susan Buck-Morss’ Hegel and Haiti (2000) and geographer Matthew Hannah’s paper on the Croissant Affair (about the Red Army Faction lawyer Klaus Croissant, not the pastry, although a pile of baked goods apparently also made an appearance in either the affair or the paper presentation…). From there, the conversation centred around the following interconnected themes: epistemic violence; racism, prisons and state control; the impact on Foucaultian discourse. In terms of ‘epistemic violence’, questions were raised around the choice of the word ‘erasure’ over ‘silencing’, and in what ways erasure might potentially be a more violent gesture than mere silencing, e.g. through the possibility of silenced voices becoming amplified again, but erased voices being impossible to retrieve. Examples from Glasgow based research included a prison art programme where the individual authorship of prisoners was denied. Curatorial practices formed another lens of looking at ‘epistemic violence’ – particularly contemporary ‘curation’ of citations in academic work: of everyone in a particular discourse, who do you cite and why? From here, we moved to questions around potential non-academic epistemic violence. In this context, the image of Black Panthers was flagged up: why do we know more about their militancy than about their community programmes such as meals for children, medical aid and alternative schooling? How much do we know about the violent sabotage of these successful ‘parallel institutions’ by the US state? A map included in the article prompted further comments on ‘top down’ and ‘bottom up’ racism, infrastructure and control. 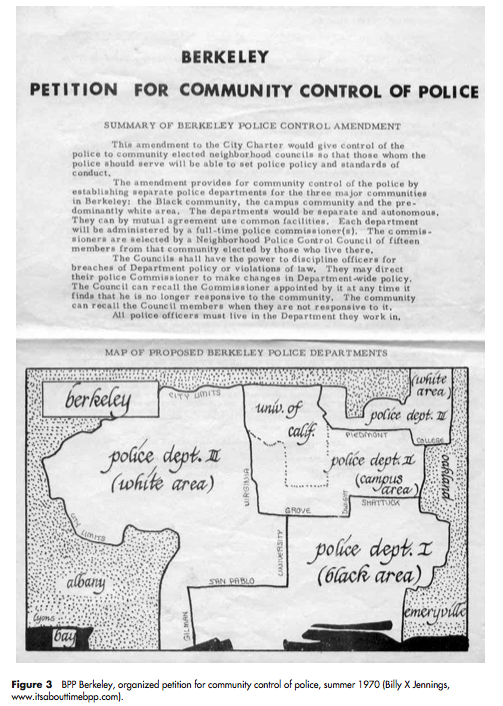 The map was reproduced as part of a Black Panther Party petition for community control of police in Berkley (California) and showed three proposed autonomously policed areas entitled I (‘black area’ [sic]) , II (‘campus area’) and III ‘white area’ [sic]). Questions revolved around whether the sharpness of these boundaries corresponded to reality and also around through what kinds of violence these boundaries came into being. 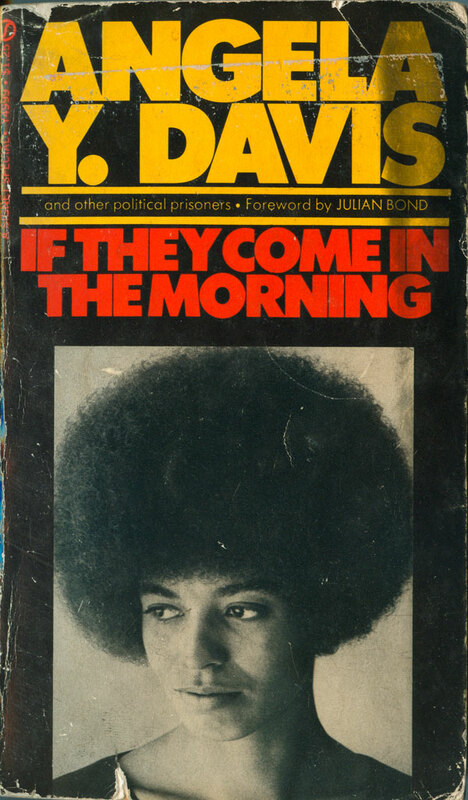 A further topic was the ‘prison-industrial complex’ (Davis) and its ethical and economic relation with communities (e.g. Black, poor, affluent). The dependency of certain communities on the labour and infrastructure provided by prisons was as much highlighted as the dubious justifications for disproportional sentences relative to the crime committed (50 years for armed robbery?) and the fabrication of evidence against Black Panther and other political activists to silence, erase, contain or control these voices. Conversely, it was noted that most political activists still managed to gain a voice through prison writings, although it was also argued that censorship of such outputs was on the increase in line with a general increase in surveillance practices. An incident from prison fieldwork in Canada, where a letter was never delivered from PhD researcher to prisoner, served as an example. Regarding the still imprisoned, recently released or still persecuted Black Panthers such as Herman Wallace, Albert Woodfox and Assata Shakur, a question was asked about the ending of the article, which argued that ‘[t]he epistemic injustice inflicted upon the Black Panthers and other third world liberation movements can be rectified and safeguarded against only after the social and political injustices inflicted upon them have been rectified’. While the reverse situation seemed almost more logical (the value of BPP activism and the injustices committed against them need to be proven in order to mount pressure for a release), it was also clear that the article was written with political urgency (the need to free the remaining Black Panther prisoners), and thus the conclusion needed to stress this in order to function as a call to action. Lastly, the soundness of the argument was debated: was the connection convincing? Where was the evidence a bit murky? Feelings around this were a bit mixed, mainly because of certain omissions that could have provided alternative answers, e.g. why was Foucault’s homosexuality never mentioned – and the potential urgency to deal with the persecution of this ‘deviance’ by states around the world? What about French citational practices or expectations of the intellectual? While such alternative explanations might not affect the deed of epistemic violence, they might have been able to provide a fuller set of potential reasons for a shift from racial to sexual politics. Overall, the Black Panther influence was regarded as plausible, given Foucault’s references of racism in his early lectures on the subject and because of his contacts with Genet. Here, we wondered about the influence of a potentially revised history on the reading and use of Foucault. With few Foucaultians in the group that day, some speculations were made about particular applications of Foucault’s theories in the department and beyond. These mostly concluded that the revised history would make a significant difference in quite a few cases. Overall, the article was appreciated as an interesting provocation that gave pertinent insights into the on-going Black Panther and civil rights struggle. It was also appreciated as a prompt to think about the reasons for and perpetuation of institutionalised/economically motivated racism and the silencing or erasure of diverse groups of people. On the 27th September 2013 the reading group began its fourth year in a rather macabre tone with Andrew’s grim yet fascinating recent work ‘Death of the dead-house in Victorian asylums: necroscopy versus mourning at the Royal Edinburgh Asylum, c. 1832-1901’, published just last year. 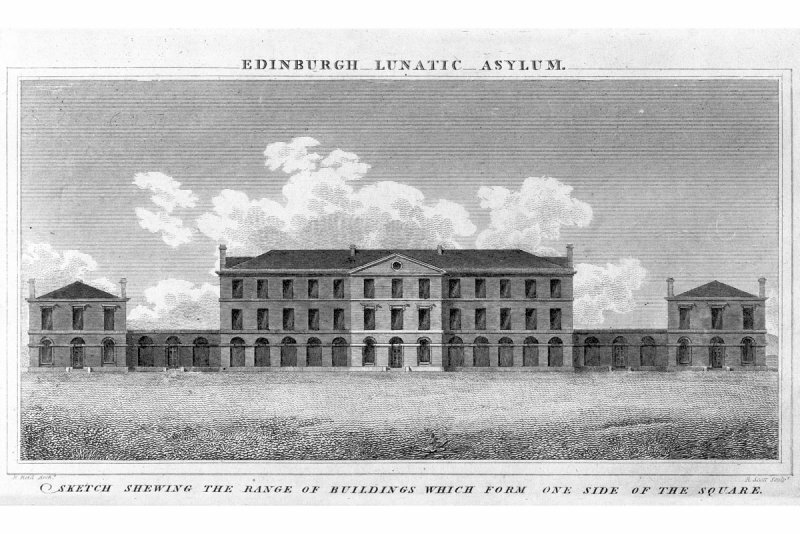 Chiming with the work of some of the group members, it set the stage for a lively discussion of the history of Scottish asylums. 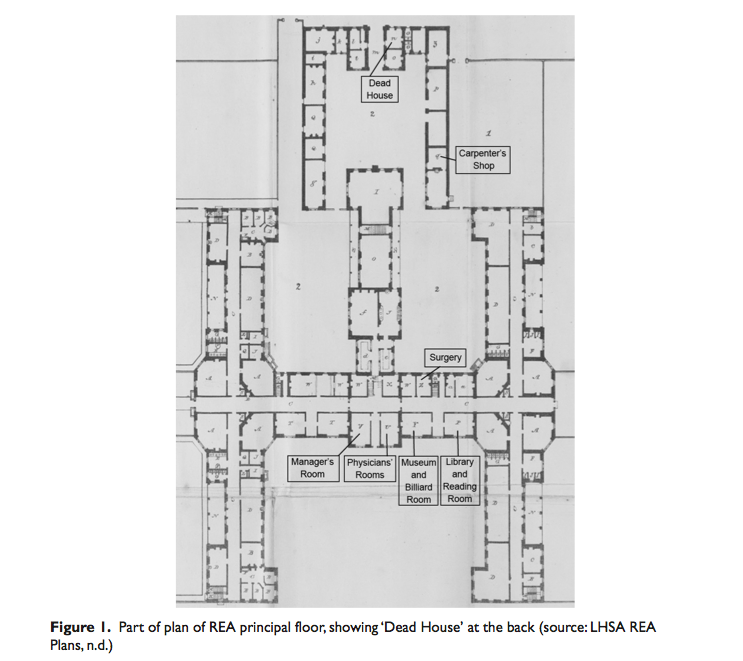 This article examines the history of the post-mortem within Scottish asylums, charting the spatial ordering of its practice, the ‘medico-moral management’ (2012:7) of deceased bodies and their subsequent dissection. In doing so it also charts the rise of the post-mortem amidst the decline of pathology and doing so details the wider significance of these acts in terms of the meaning of dissection, the means with which it was conducted and the issues concerning consent. This image, included in the paper, highlights the attempt at spatial separation of the living from the dead. However, despite the spatial distancing in physical terms, psychological distance is presented as far more blurred as the author notes the satirical skit’s which pay heed to ‘the abominations of the physic and the dissecting room’ (Morningside Mirror in Andrews 2012:13), and perhaps even more disconcerting for a midday Wednesday was the comment that ‘presumably, as at other contemporary asylums, REA’s paupers were employed in making coffins and shrouds for their cohabitants’ burials’ (2012:9). With tasks such as these, out of sight would certainly not have meant out of mind. That said, having noted that this piece was published in a historical journal, the group enjoyed the inclusion of such spatial language by a non-geographer. Of particular interest to the group was the issue of consent. The paper states that ‘The 1832 Anatomy Act stipulated that, if unclaimed or burial within 48 hours, pauper corpses could be dissected by authorized institutional parties, or sold to a (licensed) anatomy school’ (2012:10). When consent was sought, Andrew’s suggest that practices varied and emphasized the fact that ‘many [asylums] used persuasive means to secure permission from unwilling relatives or patients’ (2012:15). As such, the paper speaks to the disposability of a particular people, in particular ways, at a particular time. At this point in the discussion, interesting reference was made to the similarities in the ways in which ‘professional pressure was exerted to convert deceased asylum patients into mere pathological artefacts, serving mental science’s higher goals of knowledge production’ (2012:21), with the ways in which asylums were positioned proximate to centers of medical excellence within Canada. While the paper was generally well received, it was highlighted that the spatial is foregrounded within Andrew’s piece, a focus which perhaps leads the paper to skim over the personal stories, the religious issues involved in death and the debates over the morality of post-mortem practices. It was acknowledged that Andrews hints at concern over these issues but many felt that these concerns were not fully addressed. Such comments brought forth discussion of Sam. A Berty, a historian of science who has addressed these issues in his work and therefore could provide an interesting follow up read. All in all, not your usual conversation over a piece of cake. Neil Gray introduced the above text to the reading group last week and in doing so immediately highlighted the relationship between the publication project and the chapter we considered. Neil was involved with publishing the book as part of The Strickland Distribution, an artist-run group supporting the development of independent research in art-related and non-institutional practices. He provided an introduction to the politics of publication outside the academy. The book itself provides a detailed insight into the different strands of the ‘history from below’ tradition and the reading group agreed that the text provided a unique and important intervention within the ongoing tradition. The text provides an excellent resource for anyone unfamiliar with the discussions of key contributors within the field. The term autodidactic ‘is often used to describe the self taught person’ but what Iles and Roberts (2012:131) describe is how ‘working class people learned, wrote, and debated both alone and collectively’. This collective sense of learning was discussed by the group in some depth and linked to our own individual research areas (including museum culture in Glasgow). The complex notion of ‘talking back’ to books introduced by Iles and Roberts also stressed the importance of individual and collective audience practices and the group considered this argument particularly useful. There was a large amount of discussion about style and forms of writing, with the chapter reflecting on the political act of pamphleteering and other forms of political writing. We agreed that the style and tone adopted by the authors of this text was entirely suitable for the project. The text utilises longer quotations and spends far less time signposting particular arguments (often associated with an academic writing style). This approach seemed to reflect the tradition which the book emerges from and the group enjoyed this less academic style, which did not deflect attention from the extensive research which involved in the book’s production. One concern voiced in the discussion was the problematic positioning of Thomas Spence and Thomas Wedderburn towards the end of the chapter. This section appeared to make a significance jump from the working class self-learning practices considered earlier in the chapter and also perhaps avoided some of the more problematic tensions within Wedderburn’s life. Neil did point out that there may have been an uneasy structural tension in the translation from pamphlet to book as some sections of the pamphlet were collapsed into single chapters in book form. Overall though, the text provided an excellent insight into alternative forms of publication, dissemination and historical practices of self learning. The book itself is an excellent resource as it forms one of the few extant summaries of the broader history-from-below tradition. It also brought to an end the historical geography reading group for this year. Thanks to all who have attended and contributed over the last year and we look forward to seeing new members at the next session in September/October. Doomsday fieldwork, or, how to rescue Gaelic culture? MacDonald, F. (2012) ‘Doomsday fieldwork, or, how to rescue Gaelic culture? The salvage paradigm in geography, archaeology, and folklore, 1955 – 62, in Environment and Planning D: Society and space. The attention of the group this month turned towards the incredibly detailed piece entitled, ‘Doomsday fieldwork, or, how to rescue Gaelic culture? 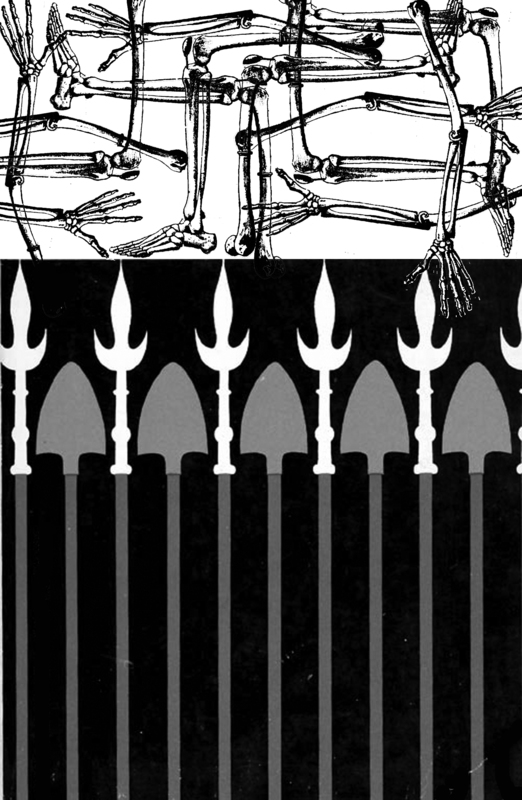 The salvage paradigm in geography, archaeology, and folklore, 1955 – 62’, by Fraser MacDonald (University of Edinburgh). Chosen, in part, for its intriguing title, the group sought to probe the paper’s inner workings and to think in more depth about fieldwork in its broadest and most intimate sense. Firstly, attention fell on the scholarship of the piece. Members of the group noted on the patient, sensitive and sustained engagement the author had with the empirical materials. For example, the section on Calum Iain Maclean was signalled as a possible paper in itself, with particular reference made to the mind-blowing nine-hour story Maclean recorded of Angus MacMillan. Clearly this project was a labour of love and this came across throughout the piece in its incredible attention to the smallest of details told in the most exquisite of ways. The group noted that there was a richness and slowness to the piece that encapsulated the spirit of the themes in a very clever way. One element that was discussed in detail was the section on Glasgow University’s Crofting Survey. Discussions ranged from thinking about the enigma of the crofting work, as it failed to ever reach a mainstream academic audience in terms of publication, to thinking critically about the historiography of fieldwork in the discipline. Questions were raised as to why the results of the survey were left so underexposed and led to a wider evaluation of academic production in the present day. Who do academics really write and undertake fieldwork for? How does fieldwork makes one feel? What do students think they are doing when they are conducting fieldwork? Finally, discussions turned to the inner mechanics of the work. Observations were made that it could be seen as a melancholic piece with elements of loss punctuating the narrative. The language of psychoanalysis runs throughout, weaving and twisting its way into the heart of the stories it tells, and eventually signals its departure point as MacDonald leaves us pondering in his final line, “But then repeating the past is always, as Freud said, another way of remembering it”. Caswell discusses the role of archives in remembering the atrocities committed by the Khmer Rouge regime in Cambodia between 1975 and 1979, and in bringing the perpetrators to justice. She emphasises the power of archives in holding the regime accountable, in particular because documentary evidence is often seen as more epistemologically valid than the oral testimony of witnesses. There are, however, differences between historical accountability and legal accountability, which may be much narrower in scope because breaches in legal protocols can make it difficult to achieve convictions. Caswell also covers the role of archives in constructing and preserving memory of the Khmer Rouge period, for survivors and for future generations. The group found that the article made for uncomfortable reading, given the sheer scale of the crimes committed. Particularly disturbing was the case of ‘Duch’, head of a notorious prison in Phnom Penh. Unlike most other Khmer Rouge leaders, who destroyed recorded evidence during the last hours of the regime, Duch instead spent the time killing the remaining prisoners, leaving behind a large archive containing details of murder and torture. The existence of this evidence was instrumental in bringing Duch to trial, but he and his team of lawyers were using the documentary evidence to try to evade justice. By treating the archive as being entirely accurate and complete, they were arguing not only that ‘if it’s in the archive, it’s true’ but also ‘if it isn’t in the archive, it isn’t true’, thus denying anything that was not explicitly mentioned in the archive. Duch seemed proud to admit his guilt in general, but was denying any specific crime that was not listed in the archive. Members of the reading group recounted their own experiences of discovering how records in archives were often not entirely accurate (perhaps because the recording categories did not fit with how things worked in practice), so no archive should be treated as the sole arbiter of truth. Some members of the group took issue with the contrast made in the paper (following Pierre Nora) between history, as the official story of past events, and memory, how everyday people recall the past. It is not clear that the two can be clearly separated. The group also discussed the potential unreliability of memory. Psychological processes may make people forget things that are simply too painful to bear. Alternatively, people who see or hear archival evidence may confuse it with their own life and think that they experienced something that did not really happen. Despite these potential pitfalls, the group saw the archive as a crucial part of coming to terms with what happened under the Khmer Rouge, especially in educating younger people. The group thought that Caswell was perhaps too evangelical about the ability of archives to provide, ‘accountability, truth, and memory’, but agreed that the paper did raise a lot of major issues concerning the use and reliability of archives. Much of the group’s previous focus has been on local archives, or ‘history from below’, so it was particularly interesting to see archives being used at a national level for purposes of historic justice. Convenors: David Featherstone, Neil Gray and Paul Griffin, School of Geographical and Earth Sciences, University of Glasgow. Sponsored by the Historical Geography Research Group and the Political Geography Research Group. For the RGS-IBG Conference 2013. 50 years on from its original publication E.P. Thompson’s Making of the English Working Class continues to inspire and to provoke critical debate and reflection. A foundational text of what has come to be known as ‘history from below’, the book has impacted on contexts far beyond the West-Riding of Yorkshire or the back rooms of London pubs that were the key sites of the book. It has been a pivotal text, even if primarily through critical dialogue, within intellectual traditions as diverse as History Workshop in South Africa and Subaltern Studies. The Making has, of course, been subject to numerous critiques and engagements notably by feminist and post-colonial critics (Clark, 1995, Hall, 1992). The cultural nationalism that informed Thompson’s work have been robustly contested by Paul Gilroy (1987, 1993). Forms of Thompsonian inspired social history have been productively taken in more transnational dimensions by Peter Linebaugh and Marcus Rediker. In geography its reception was subject to significant debate, especially in relation to Derek Gregory’s critique of Thompson’s account of the relations between class and space. Engagement with Thompson’s work, however, has been oddly absent from recent debates on workers’ agency in labour geography. His commitment to asserting and recovering diverse forms of agency in shaping class formation, however, resonates with many critical geographical projects. • Critical engagements with Thompson’s use of the terms experience and agency. 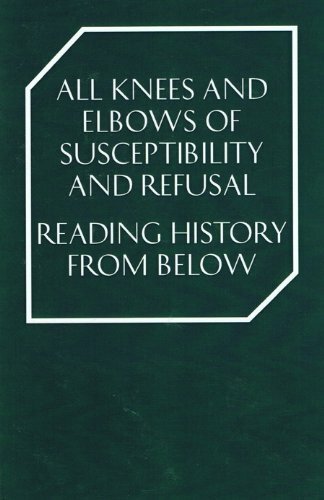 • The relations between Thompson, Subaltern Histories and attempts to think history from below spatially. Abstracts of up to 250 words should be sent to Dave Featherstone (David.Featherstone@glasgow.ac.uk) by February 8th.